Setting up email digest’s periodicity to daily will sent the email all days to your users. This periodicity option doesn’t includes any extra fields yet. Setting up email digest’s periodicity to weekly will sent the email all weeks to your users. 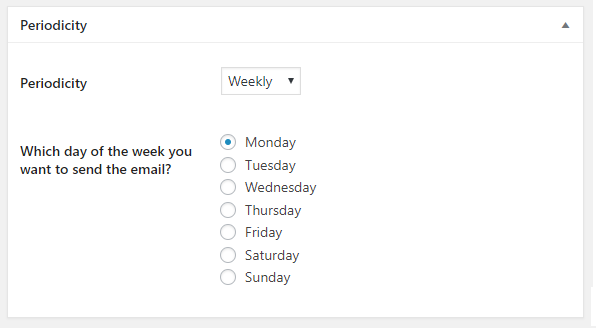 This periodicity option includes an extra field that let’s you choose which day of the week should send the email. Setting up email digest’s periodicity to monthly will sent the email all months to your users. This periodicity option includes an extra field that let’s you choose which day of the month should send the email. Note: If you set up a day higher that current month last day (eg: you setup 31 and month has 30 or 28 days) Email Digest will automatically check it to and will send the email the last day of the month instead. Setting up email digest’s periodicity to yearly will sent the email every year to your users. This periodicity option includes a extra fields that let’s you choose which day and which month should send the email. Note: If you set up a day higher that desired month last day (eg: you setup 31 and month has 30 or 28 days) Email Digest will automatically check it to and will send the email the last day of the month instead.